Looking for information while you are performing due diligence on I Components Based in Wanchai City from Hong Kong who sells Power Supplies? If you’re looking for information on this company then read the below experience of one buyer who ended up having problems with this company. You will also find some links to help you find more related information about I Components Based in Wanchai City on Supplier Blacklist and on Google as well as other bad suppliers of Power Supplies reported here on SBL. I found this company on a website when I search for SWI12-12-N-P6 but I’m sorry I cannot tell you which one it was because I goes on many. 2) Warranty time: One year. 3) Condition: New & original. 4) Lead Time: 2-3 Days. Delivery Time: 2-3 Days. Please check our quotation, if have any confirm news or order approved, we will send our proforma invoice to you. After , they send me the proforma invoice and ask for payment. Thanks for your confirm and information. Please check our proforma invoice(#021319014) as enclosed. Our bank details attached in the proforma invoice/listed below. Please confirm that you received my this mail with a proforma invoice. I’m looking forward to your update news. Since I pay the invoice. I got no news and they don’t reply to my message. I’ve sent many email to support, customers services and even accounting. This company is a scam, don’t make any business with this company. I will never pay by bank transfer again, i will use a 3rd party that can guaranty the payment like pay pal or Alibaba, etc.. Need More Info on I Components Based in Wanchai City? If you need more information, you can click the below links to search for more submissions about I Components Based in Wanchai City on Supplier Blacklist as well as go to the search results page on Google for more reviews online about this company. 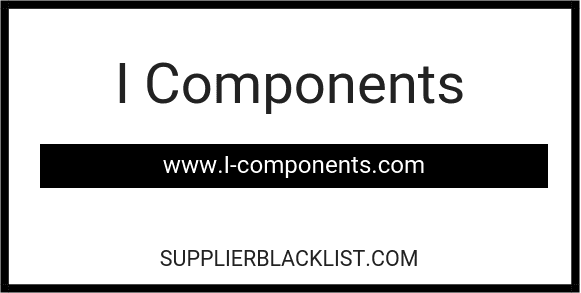 Perform a Supplier Blacklist search for more reviews on I Components Based in Wanchai City. Search Google for I Components Based in Wanchai City Reviews.